Frank walked with Josh to the locker room, then took him to the coach’s office and knocked on the door. 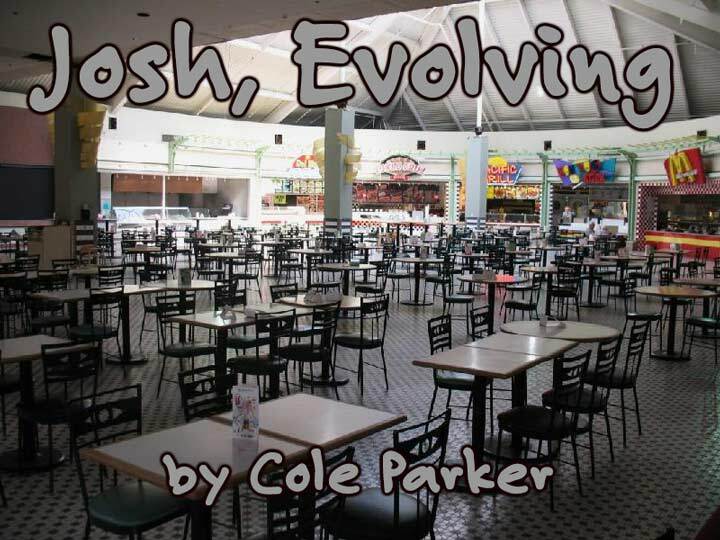 Coach McKinley was a young man of small, slight stature, which surprised Josh. He was used to large, muscular coaches with overbearing attitudes and little use for boys of Josh’s type. Coach McKinley looked to be about 25 and was smaller than some of the high school students Josh had just passed in the hall. The coach smiled at him and shook his hand, then told Frank to go get dressed. He had an easy manner about him, and his instruction to Frank sounded more like a suggestion to a friend than a teacher commanding a student. When Frank had left, the coach asked Josh to sit down, then came out from behind the desk and, pushing some papers aside, sat himself on the front edge. Josh looked at the floor, then looked up. His natural reticence when talking with someone new limited him to his usual brevity. “Surprising,” he said softly. Coach McKinley grinned at him. Josh was used to being greatly intimidated by gym coaches. As a breed, they were among his least favorite of men and certainly were his least favorite of all teachers. This one seemed different. In the first place, he seemed friendly, and in the second, interested in Josh. Weird. “Surprising, huh? Yeah, coming from Kennedy I imagine it is. I saw your papers that Mrs. Birchmeyer sent around. Now I see you. I know something about that school. I think you’re going to find you like Taft a whole lot more. “Let me tell you a little bit about gym here. We like to take a somewhat different approach to gym, different from other schools I know about at least. At a lot of schools, gym is set up for the aggressive kids, the larger kids. It’s their place to shine, and they’re allowed to do so. Many coaches and gym teachers seem to think the reason they’re there is to see students achieve certain goals or standards in their programs. They don’t like to take into account they’re dealing with kids of different abilities, different skills, and most importantly, different natures. They want certain results, the big kids and the naturally athletic kids can easily achieve those results, and so they cater their programs to those kids. But frequently those kids, because they are bigger and stronger and are being given a certain amount of freedom, take advantage of it. If they’re not restricted and limits aren’t enforced, they can make life hell for the smaller or less athletic kids. A lot of coaches don’t seem to care. He grinned at Josh, who was surprised to find himself grinning back at a gym teacher. That was definitely a first for him. “But you became a gym teacher!” Josh blurted out. He couldn’t believe what he was hearing. What this guy was telling him was pretty close to his own reactions to gym. This guy understood. But then he went on to become a gym teacher? That didn’t make any sense. Coach McKinley laughed. “Pretty strange, huh? Now I’m coaching PE. In my case, I got lucky. I had a coach who cared about the kids in his program. He was a typical gym teacher, too, in some ways. He was big and strong with a gut hanging over his shorts and a menacing sort of look to him. But he cared about his kids. All of them. He worked with everyone, the ones who had ability and the ones that didn’t. I found out, when someone took the time to work with me, I was a pretty fair athlete. I hadn’t known that before. And I found I enjoyed working out. I could tell you how I went from there to becoming a gym teacher but unfortunately there isn’t time for it, and it’d probably bore you anyway. Let me just say this. I try to do what my gym teacher did. I try to make this period of the day good for everyone. Smaller kids don’t get hassled in this program. Neither do kids who can’t turn around without falling over their own feet. They feel badly enough about themselves already without me making it worse. In here, they don’t have to worry about anyone teasing or harassing them. I won’t allow it. So it doesn’t happen here. He stood up, then turned back around. “Oh, one more thing. I guess an important thing. We do have a mandatory shower rule here. That was always something I dreaded at your age. I hated that most of all. I’m young enough that I remember all about it. I lived through it, and know how bad it can be. But now I see there can be a good side, too. Here I try to provide kids the opportunity to realize the good side and I try even harder to eliminate the bad side. The coach turned away, but Josh spoke up. After school, Josh was ready to bubble over, but the bike ride home made him hold it in a little longer. It was difficult to talk and ride. The traffic was heavy enough to make noise a problem, and they needed to ride single file to be safe. They put their bikes in the garage, and Josh began talking before they were even in the house. Bryan smiled, watching and listening to Josh gush. And he wasn’t only gushing. He was moving around the kitchen, unable to stand still. His body language was emphasizing the joy he was trying to express. Bryan was happy. He’d thought that getting Josh transferred to Taft would be a good thing, but didn’t know exactly how it would work out. Then, the previous night, seeing Josh’s fears, he wasn’t sure he’d done the right thing. Now he knew he’d made the right decision. And that made him feel good. He really liked Josh. Maybe he was paying him back just a little for rescuing him. He really hoped so. They changed, made a quick snack and ate it, then headed outside. Bryan showed Josh how to change hands when dribbling, going back and forth between the left and right, and Josh worked on it for a while. Then Bryan showed him the proper form for dribbling to the basket and shooting lay-ups. They worked on that till Josh had the footwork down and was feeling comfortable. “Okay, I think you’re ready. Let’s play a little one on one,” Bryan suggested. Josh had just made four consecutive lay-ups without missing. Bryan took the ball and walked to the center of their playing area, away from the basket. Josh stood still under the basket. Josh walked over and stood in front of Bryan. Bryan bounced the ball to him. Josh caught it, a puzzled look on his face. Josh grinned and bounced the ball back. Bryan took two dribbles to his right, then crossed the dribble to his left hand. Josh had overcompensated to stop Bryan moving right, and Bryan had a clear lane to the basket. He dribbled in and scored. They played for almost an hour. Bryan stopped occasionally and explained how Josh could improve his defense, why his position was wrong and how to do it right, how to exploit poor defense played by his opponent, how to fake, and spent a lot of time explaining what a foul was, both offensive and defensive. Josh soaked up the information like a sponge. He was learning that sports aren’t all rough and tumble and knocking into people. There was a thinking element involved, and he could quickly see that in basketball, thinking was an important part of the game. Josh took the ball, bounced it to Bryan who bounced it back. Then Josh took off on a drive for the basket, favoring his right hand as he usually did. Bryan overplayed him to that side, and as they neared the basket, Josh crossed over his dribble to his left hand. As Bryan frantically slid to his right to cover, Josh crossed back to his right hand and went up for the lay-up, laughing as he did so. Bryan couldn’t stop the shot. He’d been faked out. Instead, as Josh was going up for the shot, Bryan grabbed him around the waist. Josh looked at Bryan and saw the smile in his eyes even as he continued to argue. Josh was holding the ball, standing on the driveway near the basket where Bryan had grabbed him. He suddenly turned and shot at the basket, and as he was next to it, made the shot. “My game. I win!” he announced triumphantly. Bryan looked at him, then said, “You’re going to get it, you know!” and charged at Josh. Josh took one look, screamed and took off running. Bryan ran after him, caught him when they were in the middle of the back lawn and tackled him. Josh quickly twisted and a second later was on top of Bryan. Bryan started laughing and rolled over. They ended up wrestling and rolling all over the small back yard, both growling fiercely and laughing at the same time. Bryan was slightly larger than Josh and a little stronger as well. He realized quite soon he could dominate Josh if he tried. He didn’t. He let Josh take the upper hand and ended up being almost exclusively on the defensive. After about five minutes, Josh was on top, his hands on Bryan’s wrists, holding them flat to the ground. In this position, his body was flat against Bryan’s. Only his upper torso was raised off Bryan’s. Their faces were only a bit more than a foot apart. Josh had a huge grin on his face, which Bryan couldn’t help but respond to. The boys grinned at each other, their eyes locked on each other’s. Gradually, Josh’s grin diminished. Then, he was simply staring into Bryan’s face. He rolled off, and both boys were lying next to each other on their backs. Their upper arms were still in contact. “Bryan?” Josh was still breathing hard, the result of their exertion. Bryan didn’t say anything. The silence stretched out. Finally, Bryan sat up. Josh looked up at him, not moving himself. Bryan twisted around and looked down at him. Josh was still in an ebullient mood, but he recognized Bryan’s attitude had changed, had become more serious. He stood up and brushed himself off, then followed as Bryan walked inside. After Josh snared a couple of Cokes from the refrigerator, they climbed the stairs to Josh’s bedroom, and without a word Bryan got on the bed in the same position he’d been in the last time he’d done this, his back against the headboard. Josh got up on the bed beside him. He could see that Bryan was no longer light-hearted. He didn’t know why, or why his mood had so quickly changed from playful to downcast, if that’s what it was, but he wanted to help. Right now, just listening to whatever Bryan had to say was all he knew how to do. He hoped it would be enough.